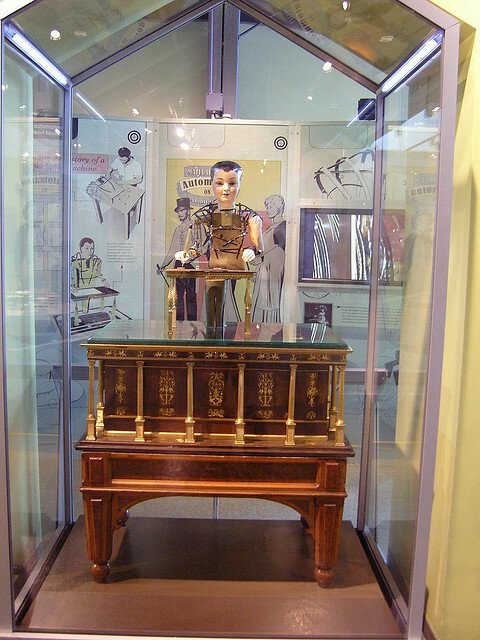 The New York Times recently ran an article about The Maillardet Automaton, which now lives at The Franklin Institute. This incredible machine was built somewhere around 200 years ago, by a watchmaker named Henri Maillardet around 1800. It is a machine that uses mechanical memory to write out, in longhand, three poems – two in French and one in English – and draw four sketches: two Cupid-esque drawings, plus a three-masted ship and a Chinese temple. 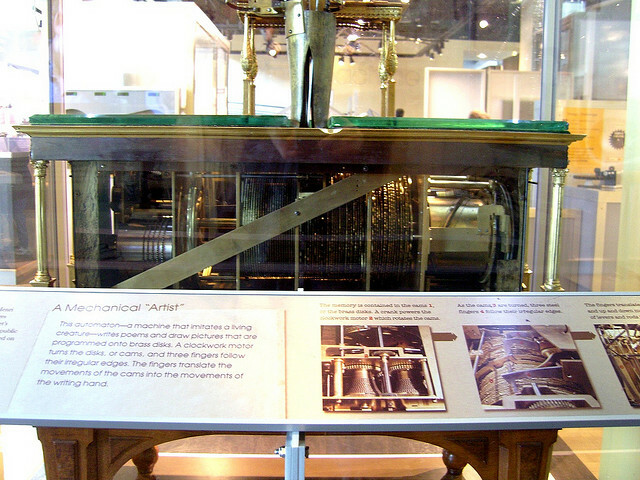 It operates using “cams”, basically wheels with bumps and notches (kind of like irregular gears), over which a lever travels, instructing the writing hand to move side to side, toward or away, and on or off the page (up and down) – in other words, it is programmed to move the writing implement in three dimensions. There are much better pictures of this here and here. Imagine the complexity that exists in such a machine. It is driven by a windable spring, like all clocks and watched were once powered. In programming such a thing, Maillardet had to account for every gesture as a bump or valley in one of the cams. A couple of interesting details, aside from the fact that it exists at all especially 200 years ago, is that machines such as these were created primarily as an advertising gimmick for watchmakers of the period; they served to demonstrate their makers’ technical prowess, craftsmanship and ingenuity. It was exhibited across Europe for four or five decades, may have been brought to the United States by the 19th-century showman P. T. Barnum, and was damaged in a fire (perhaps at Barnum’s museum in Philadelphia) before being donated by a local family to the Franklin Institute in 1928. It was in the Institute’s basement in disrepair for decades before it was recently restored to working (and presentable) condition, in 2007. The detail is amazing. In the Times article, they talk about how it has to pause for a moment at times, when the machine shifts the cam/gear mechanism slightly in order to keep writing (when it effectively “accesses more information” stored in its mechanical memory), the boy looks up from his poem or sketch, and the eyes stare out into the distance, as if he’s gathering his thoughts. Simply (or not-so-simply) superb. Kudos to Maillardet and his incredible masterpiece. I bet his watches were equally crafted.